Creating something new is always an exciting journey for artists. 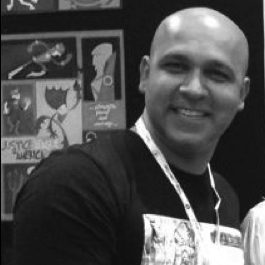 Imran Azhar’s passion for comics and quest for novelty is what got him back to Pakistan after being on the road for nearly two decades. Originally from the hospitality field, Imran’s creative company Azcorp Entertainment is all set to launch its first comic Team Muhafiz. Unlike other comics, there is no single protagonist in Team Muhafiz. There are a bunch of teenagers with one member of the group being the lead in every issue. The emphasis is on collective and collaborative efforts. “The focus is on the message itself and comic format is just a medium. I am quite confident that it will make its mark,” added Imran. “Comic as a format is cheaper in comparison to animation, which is what we want to do eventually and since it is currently self-funded, I went with this medium. We are also developing mobile apps and interactive voice response (IVR), which will have the possibility of reaching people who may not have access to internet or book stores. These IVRs will run via mobile carriers and will have a much wider outreach. The objective is to spread the message on each and every platform available,” explained Imran. Team Muhafiz is a story of seven teenagers (four girls and three boys), Parinaaz, Elaha, Mahnur, Aarya, Zane, Qani and Reza, who volunteer to revive an old and ailing Muhafiz Youth Center located in an under-privileged neighbourhood. They coach children in sports and teach music and dance, but at the same time whenever they see injustice, they stand against it. The genre a blend of mystery and action, and each storyline embedded with strong social messages such as: importance of mangroves, substance abuse, gang wars, pollution and child marriage, among other relevant issues. According to Imran, Burka Avenger and 3 Bahadur are game changers in Pakistan and the way how Burka Avenger with a female lead became a household name in a matter of a few weeks; the female leads in the comic should also be accepted in the country. “Team Muhafiz will represent Pakistan’s diverse cultures and its strong, well-informed teenage population, including young females who are leading in almost all disciplines,” he said. Promoting Indo-Pak relationship, the series has an interesting Indian character Aarya as one of the protagonists. She teaches yoga and is a dancing instructor at the Muhafiz Youth Center. She loves serenity of mind and is also the first one to stand up against cruelty and inequality. Team Muhafiz comic book will on an average consist of 20-24 pages and will be launched initially in Urdu and English Languages and based on demands, it could be published in five more local ethnic and international languages as well. The print copies will be within Pakistani Rupees 150-250, depending on pages of each issue. Free downloads via mobile apps and free reading will be provided on the website itself. The monthly comic series will be launched in March in all major cities of Pakistan with five issues in production currently. Alternatively, it will also be officially launched at the Middle East Film & Comic Con in Dubai from 9 to 11 April. Although it took six months from conceptualisation to production, the team is confident of finishing each issue within a month. Apart from this, Imran has his hands full with work on another graphic novel having over 25 heroes featuring in it. Winds of Baltoro was created some time back and its first chapter will be released by the end of this year. “Wasiq Haris has been on board on this project with me since the beginning of the company and is the main illustrator behind this project. Winds of Baltoro is a sci-fi fantasy graphic novel and begins within a post apocalyptic setting. It has over 25 heroes and they all come from diverse backgrounds. It’s a fast paced novel and will be launched simultaneously in digital and print formats,” he revealed.